This initiative supports Estonian potato growers to prevent against blight incidence and better climate control. Automatic observatories provide data and ultimately notifying farmers so they can respond with management tools. The idea for this initiative arose about ten years ago from a cooperation project between Estonia and Denmark which set up a system to gather weather data to predict the times when potato blight protection was necessary for the Jõgeva area. Expansion of the service to other potato growing areas was the logical next step. So, a commercial enterprise and the Plant Breeding Institute of Jõgeva came together to develop and provide this service. The main goal of the project is to provide a reliable alert system for farmers to prevent blight from damaging their crops. Another important aim is to provide farmers with information about temperature and moisture levels at various sites so that farm managers can respond with appropriate technologies to help maximise crop production. A network of 13 meteorological observatories have been set up through the project. Weather data from these stations is measured every half an hour and automatically saved into a server in Austria through a GPRS modem. 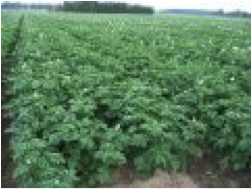 The analysis model calculates and prepares advice for potato blight varieties specific to Estonia. The i-Metos automatic observatories can measure atmospheric humidity and temperature, precipitation, aeolian speed, solar radiation, frost and soil humidity with inner ground sensor. Data from the system is available to participating farmers on the web page www.fieldclimate.com. Farmers can order a location-based forecast, as well as tap into macro information at county and country level. Crop management advice is an important part of the service package. Similar models are in place in other countries, but they can't just be replicated. Adaptation of the model is required to take account of local conditions, varieties of potato and other plants, and of course the specific blight spore types. Allikjärve village, Roosna-Alliku municipality, 73 203 Järva county.